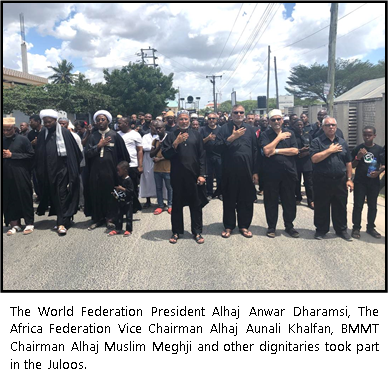 The Bilal community of students, teachers and parents from BCS School and Hawza joined by the Religious Scholars, Community leaders took part in a Juloos to commemorate the tragedy of Karbala and the martyrdom of Imam Hussein (AS) and his companions at the Bilal Muslim Mission Temeke Campus in Dar es Salaam. Approximately 1300 children, ladies and men participated in the Juloos. The teachers and staff of BCS handed out flyers with more information on Muharram and Ashura to the public and engaged in brief conversations. The speeches enlightened the crowd and the onlookers because Imam Hussain (AS) is not limited to a certain community or religion, nor is his message limited to one period of time. Thereafter prayers were held for the MV Nyerere Ferry accident victims who lost their lives in the tragic accident in Mwanza on 20th September 2018. We pray that He accepts our efforts in the propagation of Islam and in training of our students at BCS and Bilal Centers to practice the true religion of Islam.